Celtic Goddess Epona and her white mare bring dreams to you. She helps manifest the dreams if you allow her to accompany you on your path. The maiden Goddess Epona is usually portrayed as riding a white mare side-saddle, sometimes with a foal, or standing while surrounded by horses. Her name Epona comes from the Gaulish word ‘epos’ meaning ‘horse’. Her symbol is the Cornucopia (horn of plenty) which suggests that she may have been honored as a fertility goddess, although she is most commonly known as a goddess of horses and travel. She fed her beloved horses from her cornucopia filled with corn and apples, symbolic of mother-love and abundance. From the Iron Age, the Celtic goddess’ faith spread across the whole of ancient Europe, eventually being embraced by the Romans and to a certain extent, Christianity. According to many pre-Christian Roman sources Epona had a shrine in almost every stable of the Roman empire. The cult seems to have been very popular. Historians count more than 343 inscriptions worshipping her. Still in the Christian middle age, she was worshipped as a kind of holy maid for the horses. possibly the origin and one of the main centers of her cult seems to have been east France with the city of Alesia. Only in Roman times she was brought to the Britain Islands and worshipped there, but Rhiannon and Macha show that the horse cult was famous on the Britain Islands before that. Even in Romania and Yugoslavia there were found a lot of inscriptions worshipping her. Spain also has some statues and inscriptions.Our Lady Epona seems to have her beginnings in Gaul and then spread from the western coast of Ireland to the lands of Bulgaria. In Ireland, She was paired with Horned One, Cernunnos – the Mare and Stag being two potent fertility symbols. In other places, She was paired with the thunder-god Taranis. She was and is also a ‘domestic’ deity, being a goddess of fertility, prosperity, abundance as well as the aforementioned horses and horse breeding. The Celts revered the horse for several things; its beauty, speed, bravery and vigor in the sexual arena. In time, the horse came to symbolize the warrior – elites, the aristocracy, in Celtic society. They thought so much of their horses that even their greatest horse deity’s name incorporates the very word, epos, in Her name. Our Lady Epona was the only deity, Celtic or otherwise, that was adopted by the Romans without changes. Usually when they found a deity that they liked, they appropriated it and gave it the name and attributes of the Roman deity that it most closely resembled. The Roman Calvary adopted Epona wholeheartedly, giving Her a feast day of December 18. This was a unique honor bestowed on no other Celtic goddess. This is where part of Epona’s war attributes comes in. They looked to Her as a protector of both horse and rider especially the officers who served in the areas of the Danube and Rhine. Celtic warriors may have also called on Her to protect them and their horses, they used two-horse teams to pull light and fast chariots in battle. Epona was also a dream goddess, Her specialty seems to have been nightmares. She was even immortalized in a painting by Henry Fuseli’s painting, The Nightmare. Many a child in Ireland were told to be good or Epona would visit them with horrific nightmares. 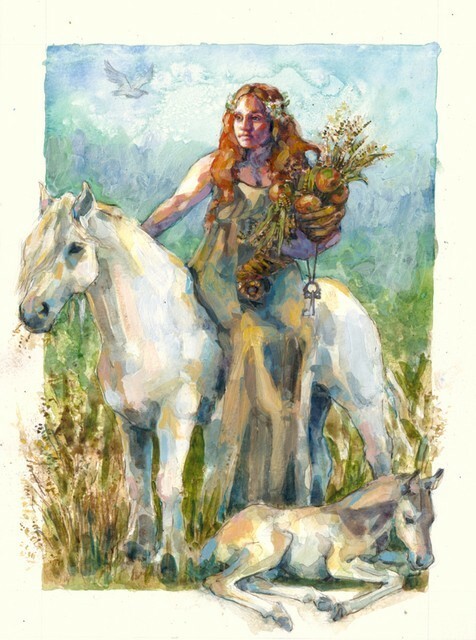 Known as Rhiannon in Wales, Macha in Ireland and Epona to the Gauls this ancient horse goddess is one of the most well-known of all the Celtic gods and goddesses. Horses played an important role in Celtic society. Naturally, the protector of horses would play an equally important role in Celtic society. She is the mistress of animals. Her many fertility attributes make her a Mother Goddess, which was maybe only reduced later to the horse-aspect. Epona is depicted sitting side-saddle or lying on a horse or standing with multiple horses around her. Much of Epona’s imagery displays the symbolism of fertility and the earth’s abundance. Epona was also associated with both water/ healing and with death. The goddess is frequently represented with a dog, which could reflect either healing or death. She is also identified with the Celtic Goddess Edain. Epona has many meanings, but first and foremost she is a divine woman riding on a mare. Her swiftness and beauty, her supernatural power, linked with fertility and tribal territory, make her a formidable goddess, especially since she may represent a path to the Otherworld. Suggested Mantra: Live my dream. I see the path intended for me. My future is full of possibilities. I invite new choices into my life. My goals are becoming manifest. I deserve to have my dreams realized. Horses (particularly: mares and foals), birds and dogs. Whip, harness and the key to the doors of the Otherworld. Rose garlands were put around her pictures and shrines.